This is the best ever mushroom soup! 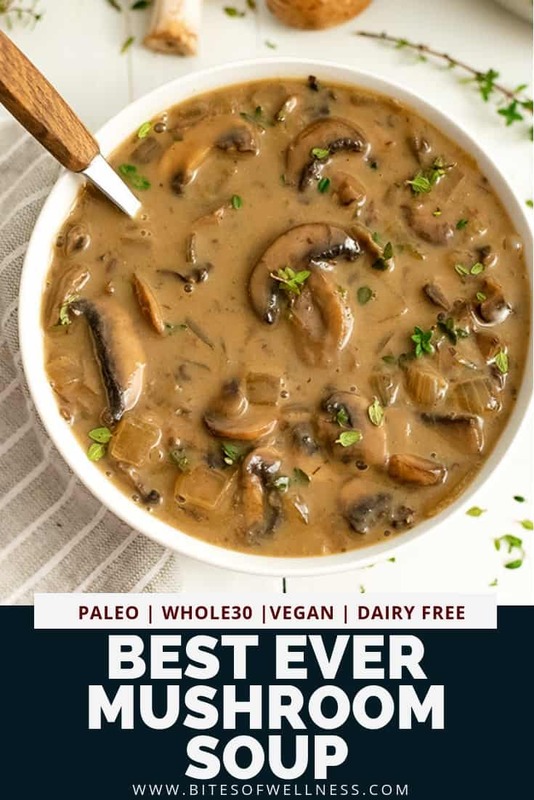 This creamy mushroom soup is easy to make, low carb, dairy free, vegan, paleo, Whole30 and keto friendly. Ready in about 30 minutes this recipe will soon become your go-to favorite soup recipe! I have this wonderful memory of having lunch with a very good friend some 4 years ago and we both ordered the portabello mushroom soup. I laugh thinking back at the uncanny silence as we savored our lunch, since there was usually never any silence when were together, mostly because I never shut-up 🙂 But sometimes food can do that. Since then, I’ve been trying to recreate a vegan mushroom soup that mimicked those flavors I still remember to this day. I think letting the ingredients shine through can really makes the difference between “the best I’ve ever had” vs. “well that was good”, especially when you are talking soup. 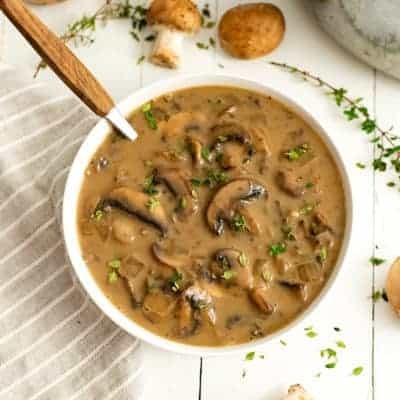 Now one of my favorite vegan soup recipes, this best ever mushroom soup recipe is a way for me to flash back to the past. I hope it becomes one of your favorites as well! 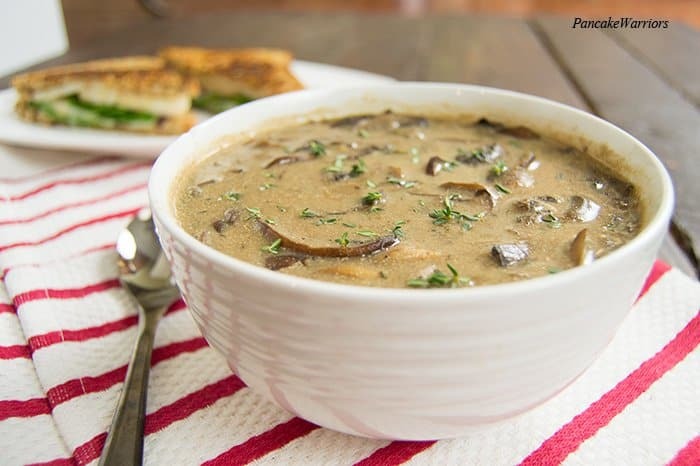 What do you need to make this best ever mushroom soup? How do you make mushroom soup? First chop the onions and slice the mushrooms. Sauté the onions until slightly softened. Add the mushrooms and allow the mushrooms to cook for 5-6 minutes. Add the fresh thyme, salt, garlic powder, bay leaves and coconut aminos to the mushroom and onion mixture. Mix the arrowroot powder into the vegetable broth and stir well until completely combined. Pour the arrowroot powder and vegetable broth slurry and the dairy free milk into the mushroom and onion mixture and allow it to come to a simmer for 15 minutes to thicken. After 15 minutes, serve hot or you can blend up some of the soup with an immersion blender to thicken the soup a little more. See how easy the best ever mushroom soup recipe is to make with the video below! This recipe uses a mixture of cremini mushrooms (baby portabella mushrooms) and white button mushrooms. The cremini mushrooms add a depth of flavor and umami that you don’t get with just white button mushrooms. You could also use shitake mushrooms, but those are usually more expensive so I stick to cremini and white button to save money. To save time, you can buy the mushrooms pre-sliced but I prefer to buy them whole and slice them myself since the pre-cut mushrooms can go bad faster. To prepare the mushrooms, use a dry paper towel to brush off any soil/dirt you see. Don’t run mushrooms under water, as they are very porous and will absorb the water, and never really develop their flavor fully. Wait to salt the mushrooms until after they have cooked down for some time. Adding salt too early can cause the mushrooms to not fully release all their water. What herbs make this the best ever mushroom soup? Fresh thyme! Fresh thyme and mushrooms are a match made in heaven! To remove the little thyme leaves from the stalk, simply hold the stalk at the very top (so the leaves are pointing up) and run your fingers down the stalk pulling the leaves down with your fingers. The stalks can be very fibrous and tough, so be sure to remove as much of them as you can. Don’t have fresh thyme? You can always use dried! Just remember that the dried herbs are much stronger, so you will want to use about 1 teaspoon of dried thyme. To get the most flavor out of dried thyme, it’s best to rub the leaves between your fingers to crush them up before adding them to the soup to help release some of their natural oils! Garlic powder is used in this recipe because fresh garlic can get a little overwhelming and burns easily. This way you get the garlic flavor without worrying about it burning! Bay leaves! Bay leaves are one of the ways to take a soup to the next level, especially soups that don’t have much cooking time. Add one or two bay leaves and let them do their magic! Just don’t forget to remove them before serving the soup (or pureeing it). 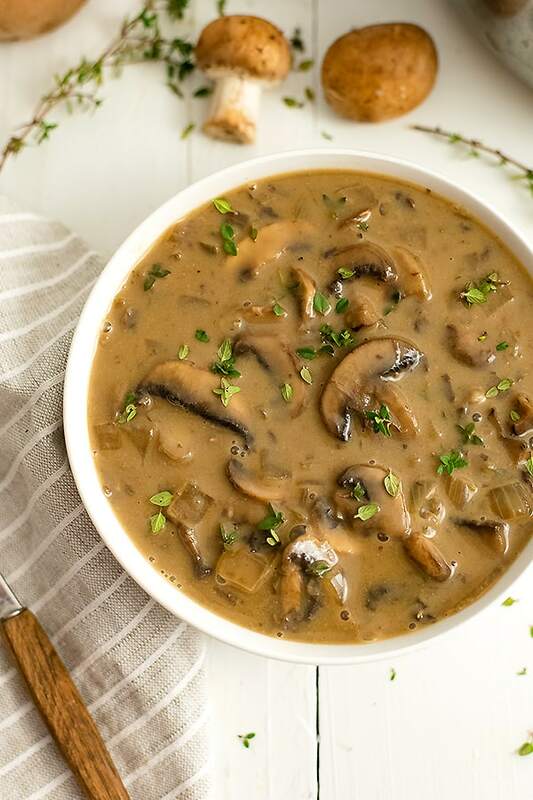 How to thicken vegan mushroom soup? 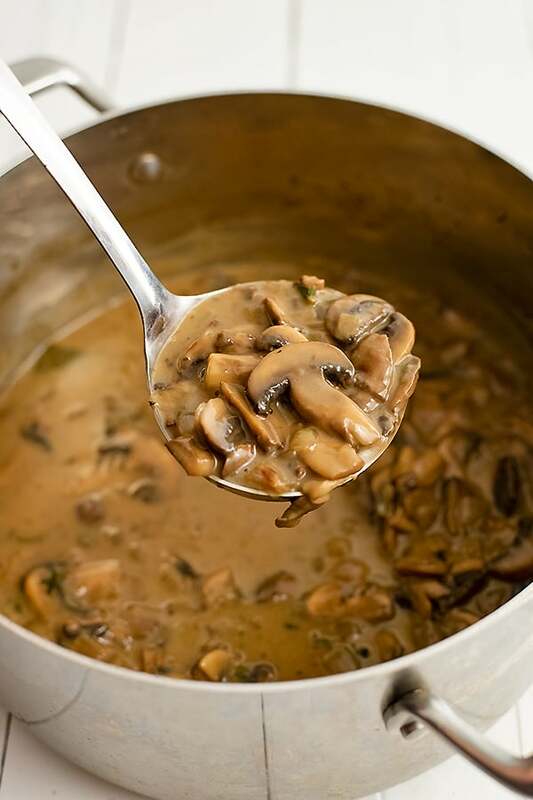 This recipe for the best ever mushroom soup uses arrowroot (or tapioca flour) to thicken the soup. It’s important that you mix in the arrowroot powder into a cold or room temperature liquid before adding it to the heat. This is to ensure the mixture is smooth since the heat will cause any clumps to clump together more. 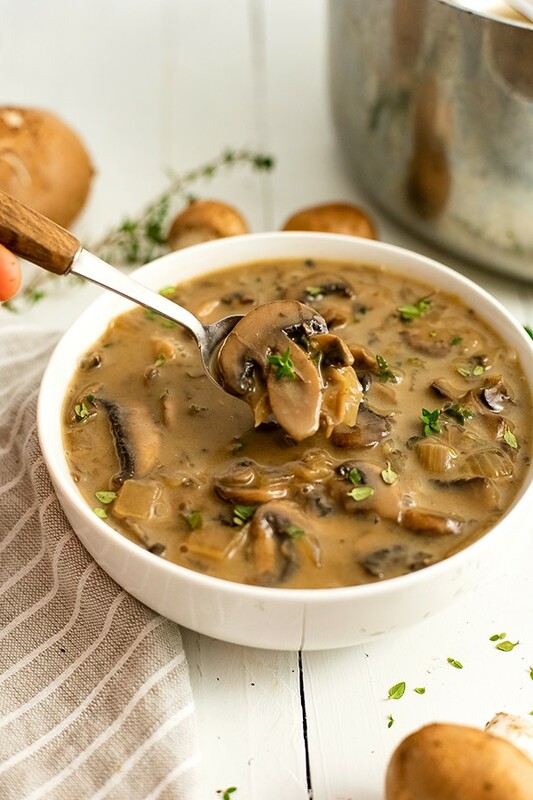 The vegan mushroom soup can also be made creamier with the addition of white beans to make the best ever vegan white bean mushroom soup, or boiled potatoes for a vegan and paleo recipe! 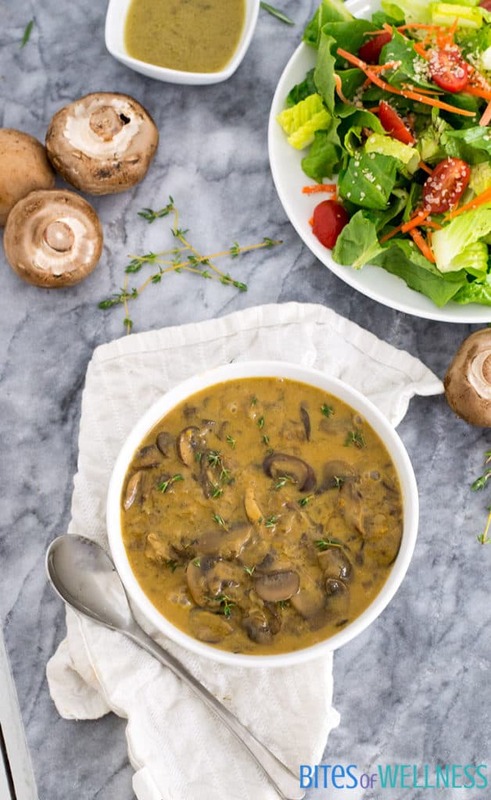 Both of these are an awesome way to add creaminess to this vegan mushroom soup. You could also add 1-2 tablespoons of vegan (or regular) cream cheese. The Kite Hill Chive Cream Cheese would be delicious stirred into this soup! How do you make mushroom soup without cream? 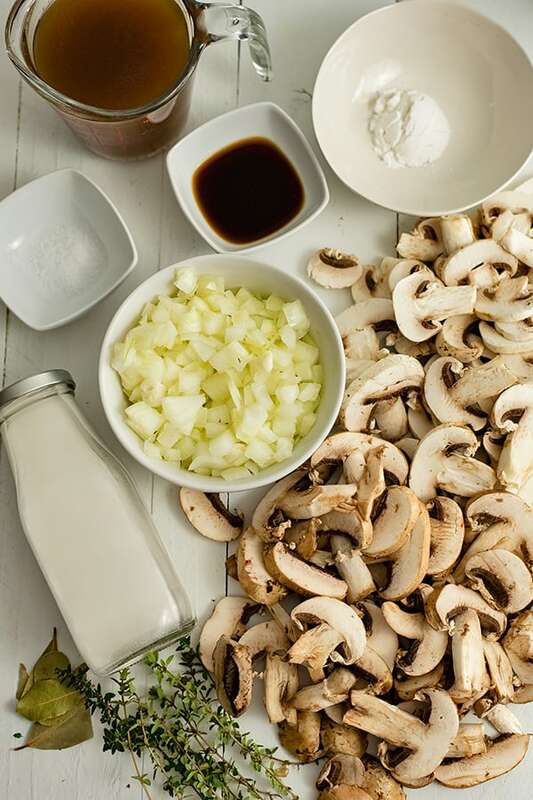 Instead of cream, this vegan mushroom soup uses a mixture of vegetable broth and dairy free milk. The soup is thickened with arrowroot powder (or tapioca flour) to help add body to the soup without the added cream. If you wanted a creamier soup, you could blend half of the soup with an immersion blender or high speed blender to help thicken it more! You could also add pureed white beans or mashed potatoes to the soup to help thicken it without cream. 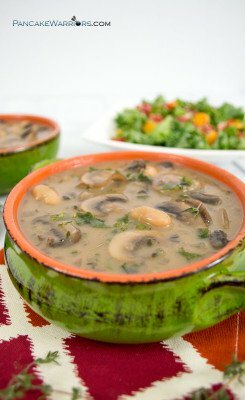 What milk can be used in this vegan mushroom soup? If dairy does not bother you, you could also make this soup with regular milk; however, I have not tested that version myself. Can you make this into cream of mushroom soup? 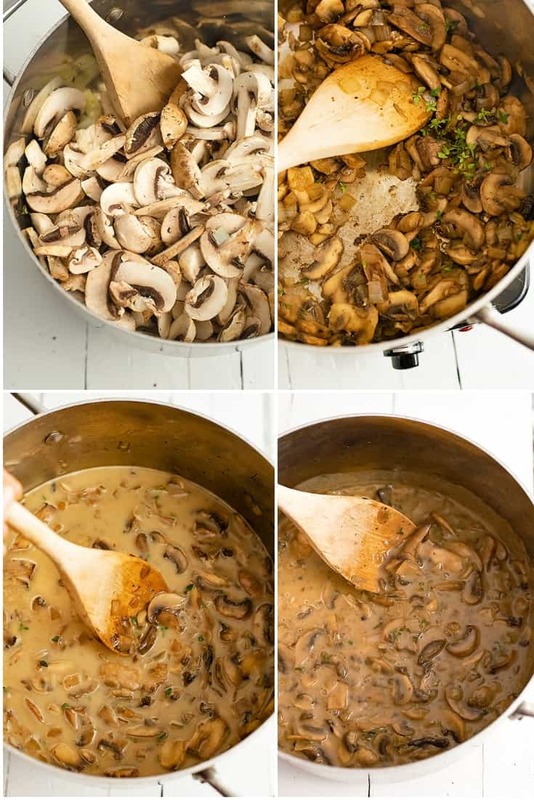 To make this cream of mushroom soup, reduce the vegetable broth by half and blend the soup in the blender in batches or using an immersion blender. Once blended, continue to add more non-dairy milk as needed until it reaches your desired thickness. If you add too much liquid, you can always add in more arrowroot powder (just remember to dissolve it in water before adding it in so it doesn’t clump). Can this mushroom soup be made ahead of time? 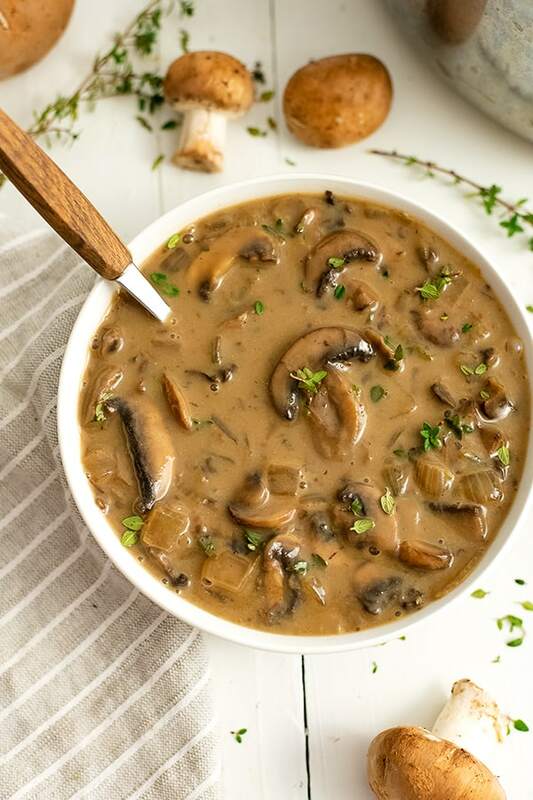 This best ever mushroom soup is almost better the next day, so if you are having company, this would be a great make ahead meal. Just give the soup a few minutes to come back up to temperature over medium low heat before serving. This recipe will last 4-5 days in the fridge once prepared. Be sure to store it in a covered glass container (I use mason jars for easy storage). Reheat in the microwave or on the stove! Can you freeze this best ever mushroom soup? This recipe only makes 2 servings, so it’s best to be served hot or within 2-3 days. Yes this recipe can be frozen. However, if you choose to freeze this recipe, the arrowroot powder can get a little gritty after freezing but this doesn’t always happen, so I prefer to make it fresh! Yes! 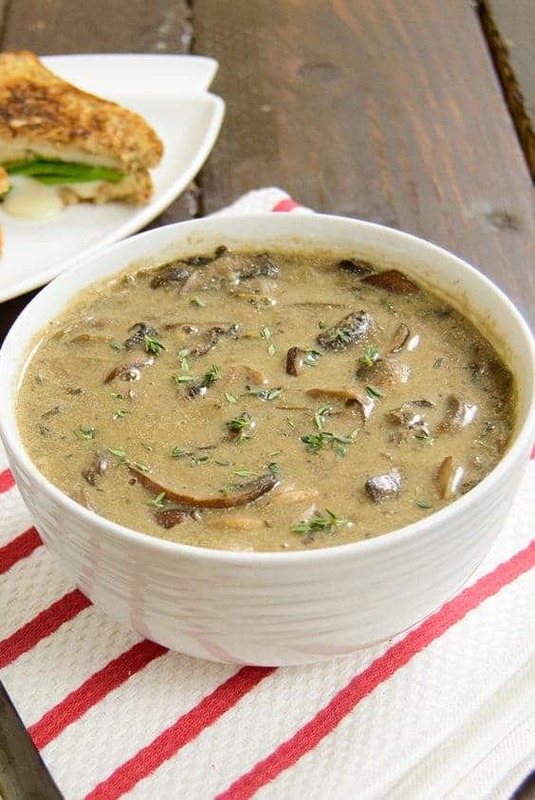 This best ever mushroom soup is made without butter or cream and is full of vegetables! This recipe is vegan, low carb, paleo, Whole30 and keto friendly and is the perfect way to start a meal or to be served alongside of your favorite salad or sandwich for a quick and easy meal! 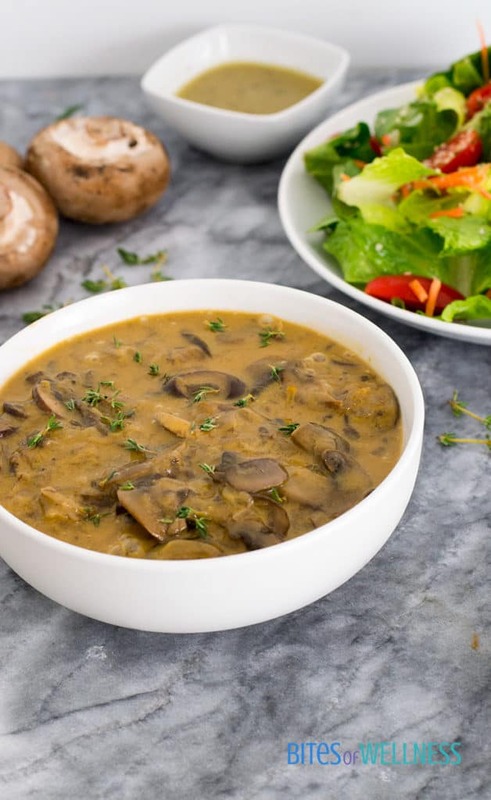 If you wanted to add more protein to this mushroom soup, you could also mix in collagen peptides (not vegan or vegetarian). The collagen peptides dissolve into hot liquid and are tasteless. They add about 10 grams of protein per scoop. In a large saucepan, over medium heat, add the diced onions. Allow to sweat while slicing the mushrooms. About 5-7 minutes. Move onions to the sides of the saucepan and add mushrooms, allow to cook 5 minutes uncovered. Stir the onions and mushrooms together. Add fresh thyme and allow to continue to cook, at least 10 minutes. You will notice a substantial amount of water has come out of the mushrooms, and they are reduced in volume by half. Add the bay leaf, the salt and the liquid aminos to the mushrooms. Stir the 1 tbs. of tapioca starch into the organic broth. Add to mushrooms and stir. Add almond milk. Allow to cook for at least 15 minutes, stirring occasionally. Taste and add freshly ground black pepper to taste. This soup is amazing the next day as well and can easily be doubled. Add cashew cheese, Parmesan cheese or enjoy the soup just as it is! AMAZING SOUP!!!!!!!!! Not “mush room” left in my belly with this on the stove. Simple, easy, fast. “Caps” off to you for the recipe! Will be making again soon. I’ve made a couple times. This time I subbed Savory for the Thyme b/c my store was out. Turned out great and I used 2 cloves of garlic and Cashew Milk. This soup was wonderful! I will be tripling the recipe next time. This was delicious. I used a canned coconut milk for this and since I had no use for the rest of the can I just put the whole thing in and used the same amount of vegetable broth to balance the flavors – and an extra splash of soy sauce. (oh and corn starch instead of tapioca). It was delicious and I think this will have to be added to my winter soup rotation. I might try someone else’s idea of adding wild rice to it, that sounds yummy! Not sure if it had the same taste. But I used coconut milk and it was amazing. Used cremini and button mushrooms still amazing. I blended half of it then added it back into the pot which I think made it much more creamy! I also replaced the tapioca starch with a table spoon of chia seeds it worked out perfectly and didn’t change any flavors! All in all I loved this recipe!! Killer soup! Just made it tonight using the random mushrooms I had on hand. 2 fresh portobello, handful dried shiitake and handful dried porcini. I hydrated the dried mushrooms in boiling broth and let them sit for 30 minutes then added to the pot after the onions and fresh mushrooms were cooked. There were no leftovers. Even my mushroom picky kids gobbled it up. I served it up with braised garlicky kale and we had plenty of soup for four people. Guess it depends on your portion sizes. I’ve added this one to our go-to recipe bank. I plan to make it for some upcoming dinner guests. Soooo yummy. This was very tasty…if you love mushrooms you will ,over this soup. I have never heard of almond cheese, but I did us the Parmesan cheese. I loved the taste and texture. It’s a keeper. I absolutely LOVE mushroom soup. Been looking for a recipe that was dairy free. so excited!!!! Making this TONITE! YES!! I made this tonight and it really is an amazing tasting soup. Thank you for this recipe! this recipe looks great, can’t wait to try it out. Do you think I could freeze this soup? I just now made this recipe. It so delicious. I had no thyme, but it didn’t matter. The soup is THAT good. Just making this….I live in a Motorhome and did not have fresh mushrooms, so I used dried ones….a combo of what I had available. Added two garlic cloves grated on microplane to onions (only had red so that is what I used) and mushrooms with stock, thyme (my friend had lemon thyme in garden), bay leaves and cooked for 15 minutes. Added coconut milk and cooked another 10 minutes (I had no liquid aminos or braggs so I ….If you want a teaspoon of Red Boat Fish Sauce would up the Umami flavor considerably which I did add. I also kept getting a picture of my cold brew coffee concentrate, so I made an Iced coffee to go with the soup and at the last minute poured 3/4 cup of the concentrate into the soup mix. I then added another 15 minutes to evolve the coffee concentrate in with the other ingredients….OMG that was the final umami item. I do pay attention when I get nudges from my inner chef to add unconventional item to my recipes…..the results are amazing. Put Maldon Salt – pepper mill – Truffle oil – and black truffle sesame salt from Vital Salts on side for Lemon Thyme friend to decide what he wants on his soup. 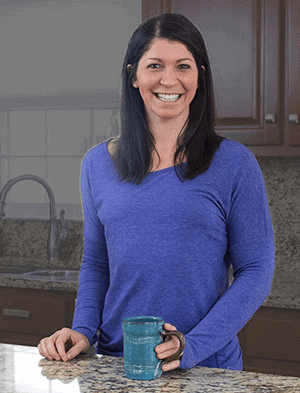 Results: Another friend just walked by my coach….I asked if she likes mushroom soup…she said it is her favorite….she said it was best she ever had. This was before I added the coffee concentrate ..will give her a taste of final product when she returns. This is now on my camping/fishing menu…no need for any of the items to be in ice chest….simple and filling. May even add some Kelp noodles (no need to put these in ice chest either) to final product to stretch further if more people shop up for dinner after a day of fishing. Thank you for this recipe! Made it today and it is very good. Added garlic and used dry thyme but will make it again when I have fresh thyme available. I enjoy a mostly plant-based diet and really appreciate adding this to my personal from scratch recipe collection. Thanks again! I made this soup today and it was really tasty. I used corn starch instead of tapioca flour, soy sauce instead of liquid aminos, and dried thyme instead of fresh. Wherever possible I try to use what I have in the house instead of buying things just for 1 recipe (ie liquid aminos). It was very creamy and filling. I would make this again for sure! Thanks for the recipe! Deeeeeeeeelicious, thanks for the recipe ? I just learned what cashew cheese is! Thank you, I am vegetarian and started becoming vegan this month. Beautiful website. I made this last night for dinner with grilled cheese and it was simply amazing. My husband couldn’t get enogh. Definitely going to make again. Thanks for the great recipe. I just made this tonight, and it was the best mushroom soup ever! I recently started transitioning to a vegan diet. The hardest part is giving up dairy. I don’t find it hard to drink almond, soy or other non-dairy milk, but cooking us a whole other story. This soup was my first time cooking with non-dairy milk. I have to admit I was a bit leery. How could a soup taste good without milk or cream? I actually almost made it with cream, but then I decided to give it a try. I was so pleasantly surprised! The soup was creamy and delicious! I did use cornstarch in place of tapioc flour, and unfortunately did not have fresh thyme, but it was still amazing. I can only imagine how good it would be with fresh, which I will definitely get next time. Thank you for such a delicious recipe. It makes the transition to vegan so much easier with recipes like this! I didn’t have thyme either but will try that next time. It still came out amazing !!! Thank you. I will definitely make this soup! I love mushrooms and my new favorite fresh herb is tarragon. This soup is amazingly delicious and appropriately named. Flavors are on point. When making this, definitely go the extra distance and use fresh thyme; it makes a huge difference. Excellent! Thank you so much for sharing this recipe. It is now in my recipe box to passed on to many others. Blessings to you! It’s kind of a miserable day here in San Francisco, and I just wanted something wholesome and earthy that would fill me up and keep me warm. I’d used organic mushroom broth and Shiitake mushrooms in place of Portobello just because I like the texture of them. Man, as a vegan, I have to say this is definitely the perfect soup for a cold rainy day! Thank you so much for this recipe, what a winner! !